Frenchman’s Reserve offers resort-style Country Club living at its finest! 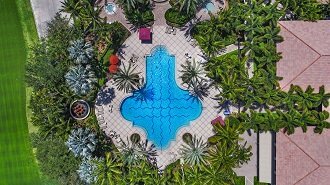 This prestigious, yet relaxed and family-friendly, gated community is conveniently located in Palm Beach Gardens, close to shopping, dining, arts, entertainment venues and some of Florida’s most beautiful beaches. It is also situated just a short drive from the Palm Beach International Airport which makes traveling a breeze! Nestled along the perfectly manicured streets of Frenchman's Reserve in Palm Beach Gardens, lies this outstanding opportunity to own a COMPLETELY RENOVATED custom home on a private street. From the moment you walk through the Black Onyx solid mahogany front entry doors you will immediately realize you're not in a production home. This concrete construction home contains 6 bedrooms, 6 full baths, 2 half baths and room for 3.5 cars in the garage. Completely remodeled with over 1 million in upgrades & custom features in this one of a kind Montecito floor-plan in Frenchman's Reserve. Sellers created a beautiful sanctuary in this transitionally redesigned home with an Asian flair! Nothing was forgotten. The entire yard was beautifully re-landscaped in a pristine Japanese flavor. Double Brazilian Mahogany front doors. A combination of new impact glass & accordion shutters installed. The Toll Brother’s meticulousness ensures that you have a house that is luxurious in every way, constructed with materials that are top notch. Enjoy relaxed luxury in over 400 Mediterranean style Toll Brother homes that include townhomes, single-family homes and even custom-built estates. The variety of home plans, shouts elegance in all respects. These home designs range from 3,400 to 6,991 square feet of luxurious living space where you can enjoy peaceful lake and/or golf views from almost every home site. The best location, amazing food, a drop dead gorgeous golf course, top notch staff, extremely accommodating…...these are the reviews that are commonly associated with Frenchman’s Reserve Country Club in Florida. And if all of that’s not enough…easily within reach are, high end shopping, museums, dining areas and a variety of public and private school options. Rest assured, the guarantee of privacy, luxury, relaxation, and convenience is one step away and it’s here at Frenchman’s Reserve.